From Kampala, the capital city of Uganda, we drove north to Nakasongola where we would visit the Ziwa Rhino Sanctuary. 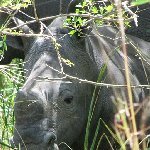 Nakasongola is located in central Uganda and the nearest town to the Ziwa Rhino Sanctuary. Luckily the road leading from Kampala to Nakasongola is an asfalted one so travel time can be reduced to about an hour and a half considering the 116 km ride. 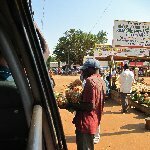 Nakasongola is also located on the same road that will bring us from Kampala to Masindi, the last town before entering the Murchison Falls National Park. But before rushing into that we visited the Ziwa Rhino Sanctuary and went on a real walking safari with two rangers. The visit to the sanctuary was part of our Matoke Tours schedule just like the drive to the Murchison Falls. It didn't take us long to spot a first rhino and I could feel the adrenaline running through my body, aren't these animals like extremely dangerous? Well, they look friendly..and besides the ranger was armed so I decided to enjoy the moment. 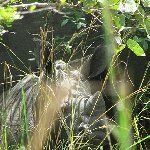 The close up pictures of the rhino's turned out great and we learned a lot about these gorgeous animals by visiting the Rhino Information Centre and by listning to our guides. The Ziwa Rhino Sanctuary has a breeding programme for the rhino and to increase their population. Therefor other predators, both animals and man, won't be allowed within the park. 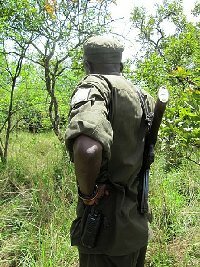 The rangers that work in the park guard the safety of the rhino's 24 hours a day and make sure nobody harms them. Moreover an electric fence keeps intruders out. There are other species in the park like monkeys, antelopes, hippo's, buffalo's and crocodiles but we sincerely had only eyes for the rhino's. 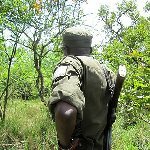 Our visit to Nakasongola was a great stopover and I'm glad we had this unique wildlife encounter. From the Ziwa Rhino Sanctuary we got back on the road we had started in Kampala and continued our way to Masindi, the gateway to the Murchison Falls. Did you enjoy Ziwa Rhino Sanctuary Uganda and have you been on a holiday in Nakasongola, Uganda? Where to stay in Nakasongola: There are camp sites wihtin the Ziwa Rhino Park but we continued our way up north.